The first thing that impresses one about Max Ophuls’ Liebelei is its rich simplicity. 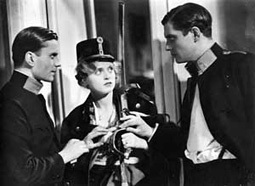 Based upon a short story by Arthur Schnitzler, it was Ophuls’ fifth feature and was completed only two years after his cinematic debut – Dann Schon Lieber Lebertran (I’d Rather Take Cod Liver Oil, 1930). What is generally impressive about Ophuls’ early films is their refinement. His films don’t rely upon visual metaphors, nor the “significant” use of editing, to make their successive images tell us what the actors don’t express verbally or what the audience would not understand without extra help. The sense of cinema these early films communicate is direct. Ophuls’ first milestone, and third film, was the little known masterpiece Die verkaufte braut (The Bartered Bride, 1932), an operetta-style musical that is even better than Lubitsch’s then celebrated works with Jeannette MacDonald and (usually) Maurice Chevalier. Its expressive qualities suggest that Ophuls must have had a long, established career in the silent era. In the early 1950s, a period which sees the emergence of modern film criticism, Ophuls was working in France and aroused the interest of many young critics, sparking a rediscovery and reconsideration of his early films. This situation, paradoxically, damaged the belated recognition and reputation of Liebelei. Due to the existence of Une histoire d’amour, the French version of Liebelei that Ophuls shot sequentially, a lesser version of his opus, with a disputed editing, was the one that was re-evaluated. In 1933 Ophuls was an amateur, in the broad meaning of the word (he later pursued a style; perhaps more complex, but not qualitatively better). Although the opening scene of Liebelei, if it had belonged to one of his 50s movies, would show a clear resemblance and kinship with Luchino Visconti’s Senso (1954), the function of setting and lateral camera movements in this early work was not to create an atmosphere, and we don’t find those evolving sequence shots for which he later became so famous. He reached his recognisable personality through a process of evolution, as did Alfred Hitchcock and Fritz Lang, not as a conscious objective. So Liebelei, as Jacques Lourcelles described it,1 attains, so early in his career, a perfect classicism, far away from his later more baroque achievements. In those early years, Ophuls aspired more to the fullness of mise en scène than to the absoluteness of style, assembling the pieces of an “emotional puzzle” the better to film a life that escapes from every frame. Liebelei contains many elements that were developed in Ophuls’ later films, but we shouldn’t call it a sketch – Ophuls’ achievement here is considerable. In fact, only a few newcomers who had never worked in silent movies (I’m thinking of Sacha Guitry, Raffaello Matarazzo, Humphrey Jennings, among others) reached a similar level of filmmaking craft in this period. The sombre theme of the plot powerfully contrasts with the film’s intelligent, subtle, light dialogue (recalling Leo McCarey’s The Awful Truth, 1937, rather than such a mature work such as An Affair to Remember, 1957). It seems that characters rarely say what they are thinking. Thus, although Liebelei is, in many ways, an archetypal “tear-jerker” of its era, its storyline differs from that found in the majority of silent movies because of its highly expressive use of the dialogue. The long scene in which Fritz accompanies Christine (played splendidly by Magda Schneider, Romy’s mother) home shows, perhaps unwittingly, that a new era had arrived. Fritz says nothing but, almost imperceptibly, the girl’s face begins to reflect the happiness she feels, awakening to love without a signal from him. After the introduction of sound silence could now be deafening, a point Ophuls knew very well. V. F. Perkins indicated, brightly, the influence of viewpoints and camera placement apropos of a scene in Otto Preminger’s Carmen Jones (1954), in which an intimacy is established between Harry Belafonte and Dorothy Dandridge’s characters.2 In Liebelei we can find another superb example of this combination: in the scene where Christine realises how little she knows about Fritz, it is difficult to know how confused she really is because of the pauses within and the lyricism of the shots. The scene develops and ends with a kiss, ultimately wiping out her suspicion. A deep and moving sentiment is brought about by the complete sequence, and it’s precisely the rhythm of emotions created that deeply move us. In Liebelei, as in many Frank Borzage films, romantic love is the ideal state, the overriding concern, and it transcends material needs. For lovers, life seems to move away from its social basis: to lonely streets, empty cafes, dreamed landscapes. But in Ophuls’ cinema, contrary to Borzage’s, we are shown obscure corners of settings and given information that characters ultimately ignore (as in Werther, 1938, Sans lendemain, 1939, Letter from an Unknown Woman, 1948, Madame de…, 1953, et. al). Ophuls prefers giving all the facts to the viewer while Borzage walks along, hand in hand, with his creatures. Liebelei’s Christine says, “I’ve met love”, increasing the viewer’s feeling of the fugacity of happiness. No matter what happens in her life, beginning now, she feels compensated; it’s one of the most beautiful moments in the film. The penultimate scene of the film, so cruel and terrible, contains one of the most beautiful close-ups in the history of cinema. But there are two other moments that are even more amazing: the slow close-up as Christine’s father remembers his sister (reminiscent of the rhythm and purity of Satyajit Ray’s Aparajito, 1956); and the sublimely smooth transition between the two balls, first showing Fritz dancing with Christine and then, the next day, with the baroness. For Max Ophuls, it’s all about a vicious circle that is ultimately certified by La Ronde (1950) and Lola Montès (1955), his baroque works par excellence. Jesús Cortés writes for El Unicornio, a Spanish magazine about cinema and culture, and for the Rotten Tomatoes website.